Eight girls, including a minor, were rescued from a brothel on GB Road in a joint operation by the Delhi Police and NGO Shakti Vahini on Saturday. Senior police officers said a woman identified as Padma has been arrested. 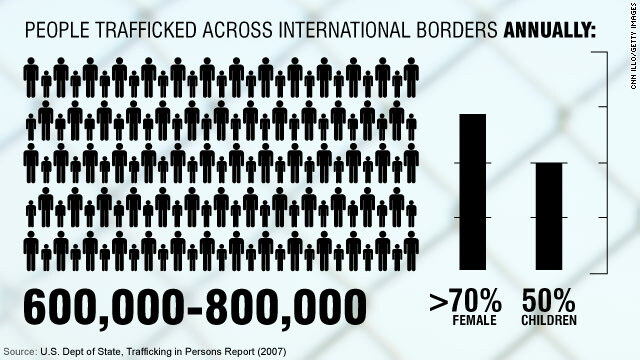 The girls, who are from West Bengal, were allegedly trafficked to Delhi after being lured on the pretext of marriage. The Delhi Police confirmed the raid and said the girls were hidden in a “hollowed out almirah”. “They were hidden in an almirah which had been modified to make a hiding place. Seven girls have been sent to Nari Niketan, while the minor girl has been sent to a protection home,” an officer said. “We will write to the DGP, West Bengal, and the Ministry of Home Affairs to ask for an enquiry into the trafficking of women from West Bengal,” Kant said. NEW DELHI: Six days after a tribal girl from Uttar Dinajpur in West Bengal was found dead in mysterious circumstances at the residence of her employers in sector 49, the Faridabad police arrested the owner of a Delhi-based placement agency, Rafiq, on Saturday. He had been booked on the basis of an FIR on a complaint of the deceased domestic worker’s mother. With a second postmortem to establish the cause of death expected only by Monday, the girl’s decomposing body, for now protected by ice bars, lies in an ill-equipped and mice-infested “dead house” in Faridabad. The police personnel of Dabua Chowki, under Saran police station, arrested Rafiq, who owns Laxmi Placement Agency in Tughlaqabad. He had allegedly brought the girl from her village after taking the consent of a relative, according to the mother, who was unaware of her daughter’s presence in the city. The police will also be investigating the role of the affluent family that hired the girl for house work in March allegedly for a meagre Rs 3500 despite the fact that she appeared to be a minor. The police have registered a case against both the placement agency owner and her employers under sections related to kidnapping, trafficking, child labour, abetment to suicide and Juvenile Justice Act applicable to minors. The mother also wants a case to be registered under the SC/ST Atrocities Act. The mother, herself a domestic worker employed in Janakpuri, has alleged that her daughter was only 13 and a very strong person who could not have committed suicide. She has claimed that the child, who was going to school in her village, was brought to Delhi without informing her husband who was taking care of the children while she worked in the capital. The mother has, meanwhile, expressed shock to learn that a postmortem had already been conducted without her permission and the report declared it to be an ordinary death due to hanging, making it a case of suicide. She has now sought a fresh post-mortem. Compounding the tragedy is the growing concern over the decomposing body and desperate search for space for burial. Social workers from NGO Shakti Vahini were seen frantically reaching out to different Christian institutions as they tried to seek space in a cemetery. “We were shocked when confronted by the demand for a certificate to show that she was a Catholic Christian before she could get burial space. When we told them that we did not have any such document and explained the situation, we were turned away,” said Rishikant of the NGO. 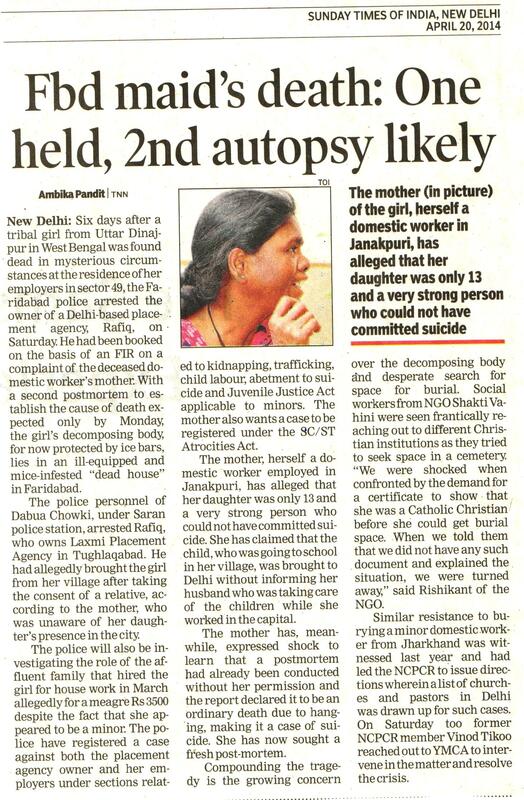 Similar resistance to burying a minor domestic worker from Jharkhand was witnessed last year and had led the NCPCR to issue directions wherein a list of churches and pastors in Delhi was drawn up for such cases. On Saturday too former NCPCR member Vinod Tikoo reached out to YMCA to intervene in the matter and resolve the crisis. NEW DELHI: The tribal girl who was found hanging from a grille at her employer’s house in Faridabad five days ago was a schoolgoing teenager at a village in Uttar Dinajpur, West Bengal till about seven months ago. Her mother has alleged that she was not more than 13 years old and was lured to Delhi by a placement agency owner. The girl’s parents did not know that she was employed here. An FIR under legal provisions for trafficking, Juvenile Justice Act and Child Labour Act has been registered on the basis of the mother’s complaint. Shocked to learn of her daughter’s death, the woman has sought a thorough probe into the role of the family that hired her daughter in March for housework, and strict action against the unregistered placement agency involved. The case was registered by the Dabua police chowki of Saran police station in Faridabad late on Friday evening, five days after the death occured. The girl’s decomposing body for now lies in the “dead house”. A second postmortem may be carried out to rule out foul play before she is laid to rest at the burial ground of a Christian cemetery here. “I want to know why my daughter died? I don’t believe she committed suicide. She was very strong,” the mother told TOI after identifying the body. Despite her loss, the mother, a Christian, stood strongly rooted in her faith as she fasted through the day to mark Good Friday. Now she only wants justice for her daughter. She has been employed at a house in Janakpuri since October and says her husband daughter and sons were all staying at home when she left her village in September. “My daughter said bye and left to get wood for cooking. She was a very hard-working child and studied in class 1. She took care of the house and also did housework to help me. She was not the kind to kill herself.” The woman said she came to Delhi to earn for her family as extreme poverty hounded homes in her village where most people, including her husbands, have only day jobs. She got to know of her daughter’s presence in Delhi and her death only on April 17 when the placement agency owner who brought the girl to Delhi tried to reach her through another agency that had provided her employment in Janakpuri. The woman has alleged that Rafiq, the owner of Laxmi Placement Agency in Tughlaqabad, never tried to contact her before to inform her about her daughter’s presence in Delhi. “I worked for the agency that employed my daughter in my previous stay in Delhi as a domestic worker. Despite knowing me, the agency owner never told me that my daughter was here. Even my husband did not know her whereabouts as the placement agency brought her to Delhi by taking permission from a relative,” she told TOI. NEW DELHI: A tribal girl from West Bengal was found hanging from a grill in the courtyard of her employer’s house in Faridabad on April 14. She had a dog’s leash around her neck. Till date, no FIR has been lodged in the case. 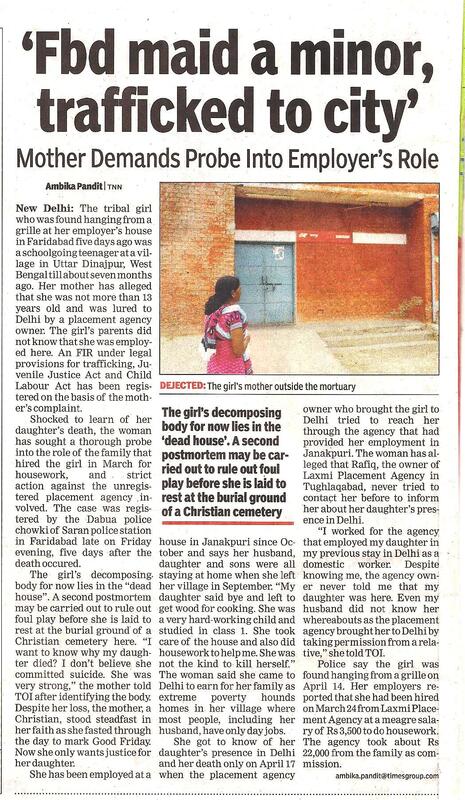 While the police blame their helpless on the absence of a report, the girl’s body lies in a mortuary unclaimed. Attempts are on to track her family in Uttar Dinajpur and bring them to identify her. The case, yet again, brings to the fore the rising cases of exploitation of domestic workers from tribal belts. In the absence of laws to regulate domestic work and placement agencies, these girls live and die without any identity or rights. Police officials from Dabua Police Chowki of Saran police station had found the girl’s body in Sector 49 of Dabua Colony after her employers informed them. The employers told the police that the girl was hired on March 24 from Laxmi Placement Agency and she appeared to be depressed. But so far, no one has inquired into the alleged cause of depression or the girl’s employment history. The employers told police that it was a case of suicide. Police, however, has not initiated any inquiry to investigate the role of the employers in the case. There is also no clarity on the girl’s age as she appears to be a minor. Preliminary inquiry shows that the girl was hired for a meager salary of Rs 3,500 to do the house work in a family of six members, police said, adding that the placement agency took around Rs 22,000 from the employers as commission. Strangely, the placement agency owner has been tasked with the job of finding the girl’s family and bringing them to the police station. Meanwhile, the police officials say they are trying hard to keep the body from being eaten away by mice in the “dead house” where the freezer facility is not working properly and ice is being used to preserve the girl’s body. While mystery shrouds the domestic worker’s death, NGO Shakti Vahini has written to the Faridabad police commissioner seeking an investigation into the matter from the point of view of inter-state human trafficking (West Bengal-Delhi-Haryana). 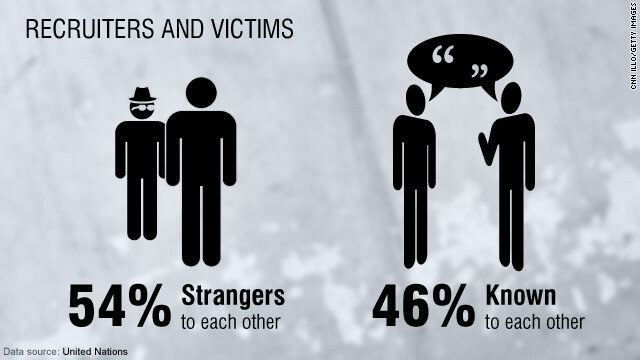 “It is a matter of concern how the girl came in contact with the placement agency. What is the legal status of the agency? The girl’s age is also a matter of investigation,” the letter states. 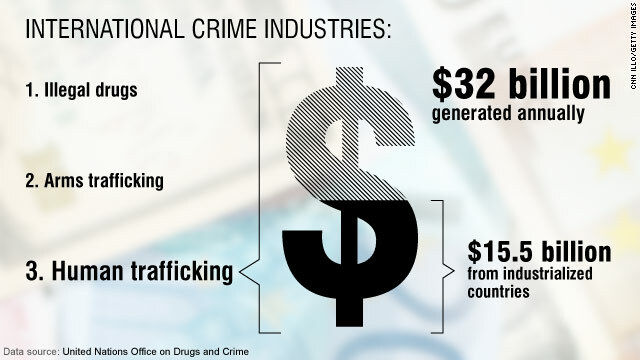 Meanwhile, experts working on trafficking cases feel that much time has been wasted. Former member of National Commission for Protection of Child Rights, Vinod Tikoo, cited Section 174 of the Code of Criminal Procedure, 1973 to point out the role of police to enquire and report on suicide, and such matters. As per the Code, a police officer has the power to inform an executive magistrate empowered to hold inquests. The police can also make a report on the basis of spot examination and preliminary investigation into cause of death to enable the district magistrate to act.